It seems most of us fishermen got our start on a trip to the “wilds” of a pond or lake with our dads. Looking back, I realize it was as much about spending time with my dad as catching fish. For me it started with a bamboo pole, a hook, a sinker, a bobber and a worm. My first catch was a Bluegill. Though the fish ended up back in the water, I was the one that was hooked. I have fished ever since. Like anything we do, with repetition comes skill and knowledge. However, this type of education (the “doing” kind) is limited by our experience. If all my fishing experiences were limited to that first pond and a bamboo pole, I’d still have a pretty narrow view of fishing. Once I started fishing in creeks, rivers and marine environments that skill and knowledge expanded. Talking to and fishing with other people allowed for even more learning and what I learned revealed as much about fishermen as fish. The Longnose Gar is an example of this experience. My first encounter with a live Longnose Gar was as an adult. It conjured up thoughts of prehistoric sea creatures with which I had often dreamed of being contemporaries. While the many teeth protruding from its long snout gave me a sense of trepidation, I yearned to get a closer look and touch its strange scales. Surely this had to be a not-so-distant relative of the plesiosaur. My brief reverie was interrupted by several surprisingly scurrilous remarks directed at the fish from a couple of local fishermen that were near us. While their intent may have been to demean, debase, and engender malicious intent, in my mind I wondered what hidden powers this creature might have to elicit such vitriol. I determined I had to know more. As it turns out the Longnose Gar, Lepisosteus osseus, has, in fact, been around for some time. Fossils of this ancient fish have been found alongside dinosaur fossils (McGrath, P.E., E. J. Hilton, 2011)…in other words they are what they appear to be: prehistoric. The female Longnose Gar does not mature sexually till she’s 6 years old. She can reach a length of over 6 feet, weigh as much as 55 lbs. and lives an average of 22 years (the oldest recorded age is 39 yrs.). The males are smaller, shorter lived and mature in half the time. They are skilled predators and will eat almost any fish that they can get in their mouth. However, they demonstrate preferences for certain species depending on where they’re found. Most commonly these will include clupeids (shad and herring), cyprinids (minnows) or Lepomis sp. (sunfish). Longnose Gar was a major food source for Native Americans and the early colonists in Virginia. Unfortunately, in the early 1900’s these fish began to be characterized as worthless and destructive. This attitude toward gar has deteriorated to the present day, as exhibited by the local fishermen during my first encounter with a Longnose Gar. But what is the source for this characterization? Most likely it is an accumulation of unfavorable experiences combined with the embellishment necessary for telling a good story. When caught on a fisherman’s line, the gar will twist or roll in an attempt to free itself. This creates a tangled line, the bane of fisherman, and a battle with a thrashing head of razor sharp teeth. When caught in a net, their twisting flight response produces a hopelessly tangled knot of beak, teeth and net. While the meat of the gar is edible, it is only mildly so to most modern palates and the effort to prepare it is hardly worth the tangled line and slender, bony fillets. Add to this the perception that their voracious appetite is responsible for the reduction of the target population (game fish) and it is not difficult to imagine the inevitable deterioration of the Longnose Gar’s reputation. Yet even with humans a reputation is at best tenuous, particularly if it’s a good one. In the end a reputation tends to be little more than an accumulation of a few experiences interpreted by a preponderance of opinion. Wisdom would always dictate closer scrutiny. In the economy of ecology where nature dances in perfect step with the law of sensitive dependency on initial conditions (popularly referred to as “The butterfly effect”), the Longnose Gar is no less, and perhaps more, important than the symbolic butterfly. In natural systems where gar populations have been depleted there is more often a dynamic increase of forage fish populations such as gizzard shad, sunfish or minnows and not the anticipated increase in game fish. In actual studies of the diet of Longnose Gar, game fish represent about 1% of its diet (Eschelle, 1968). Further, the Longnose Gar is an important host for the glochidia of the freshwater mussel Yellow Sandshell (Lampsilis teres). Due to its sensitivity to pollution this mussel has become endangered in much of its range. Eliminating Longnose Gar from a system would play a major role in eliminating this sensitive mussel as well. Despite its ability to adapt to and thrive in a wide variety of conditions ranging from very low oxygen waters to salinities up to 33 ppt., it has been designated as a threatened species in 3 states due to human activities, unintentional and intentional. So, reputation notwithstanding, when we elucidate the ecology of the Longnose Gar (and any organism, for that matter) we can see the wisdom of considering the matter well prior to taking action effecting its very existence. 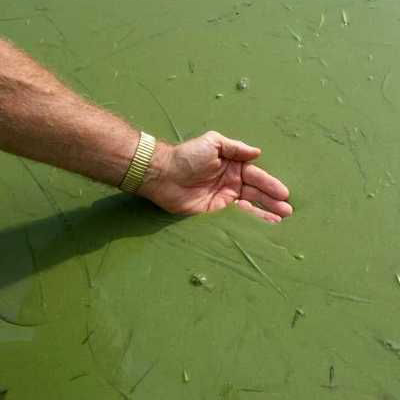 It seems that every day we hear new stories of nuisance algal blooms, Microcystis cyanobacteria and water borne toxins causing our water supply to be unpleasant and unsafe to drink and making recreation impossible.